So begins the Wild Free-Roaming Horses and Burro Act that was signed into law by President Nixon in 1971. It leads us to believe that the wild mustangs and burros that roam our vast American West are thus protected from being driven out of existence. Sadly, in spite of this law, that is not the case. Under management by the Department of the Interior’s Bureau of Land Management, there are currently only 24,000 to 37,000 mustangs left in the wild. The drive to “zero out” or eliminate wild horses and burros from our public lands is an ongoing process that has removed over 22 million acres as wild horse habitat in order to appease private ranchers and corporations who graze their livestock on public lands, land that was set aside nearly 45 years ago for the horses. Wild mustangs and burros are systematically rounded up by chasing them with helicopters, often resulting in the death of those too young or too old to keep up, and then forced into holding pens. Bands and families (horses are herd animals that bond with each other and form strong ties) are ripped apart, with young foals often being separated from their mothers. While a lucky few are vaccinated and returned to the range, most are held indefinitely, costing taxpayers $80 million dollars a year to feed them as they languish in holding pens all over the American West. Some are put up for adoption for $125 each, but as with the countless dogs and cats sitting in shelters, there are too few loving homes. Shockingly, some end up going to slaughter. The difference here is that the horses and burros are wild creatures and they are supposed to be protected by this law (which has been amended since 1971 to accommodate the BLM’s methods of management), and they are supposed to be free to roam on the public lands that belong to you and me. All their websites are most informative about what is currently happening. 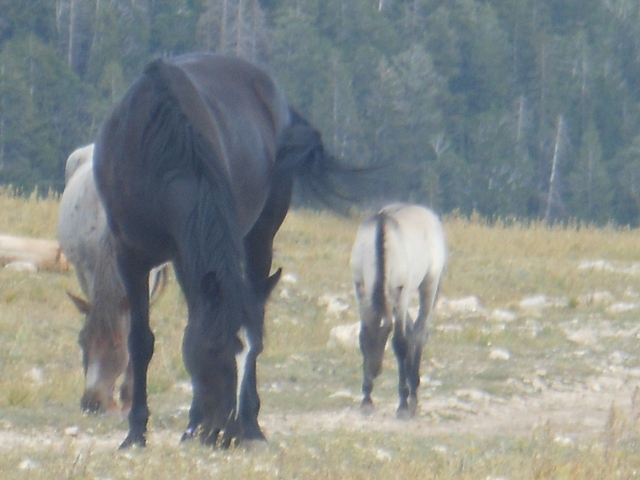 You can also sign up to receive the Wild Hoofbeats newsletter (www.wildhoofbeats.com) that keeps concerned readers up to date on the state of the wild mustangs and burros, icons and legends of the American West. Photo credit: The above photos were taken in the Pryor Mountains by Chris Kubash.